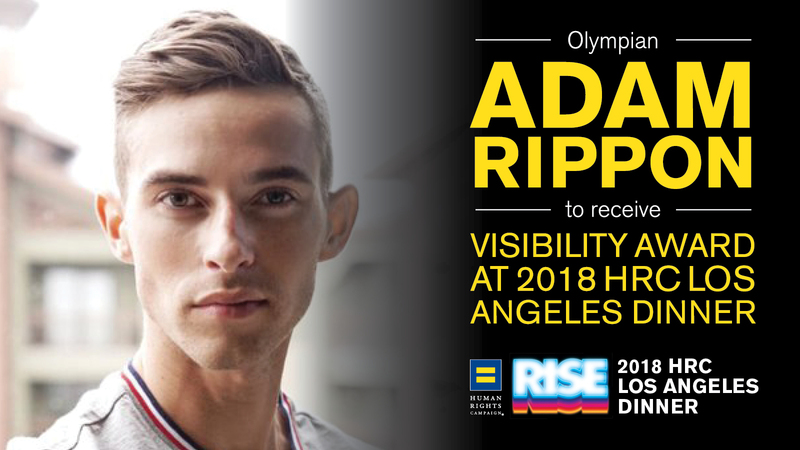 Today HRC announced that out gay Olympian Adam Rippon will be honored with the organization’s Visibility Award at the 2018 HRC Los Angeles Dinner this Saturday, March 10, 2018. Special guests also include out gay Olympian and past HRC honoree Gus Kenworthy, Teri Polo and Sherri Saum from Freeform’s "The Fosters," Josh Duhamel from "Love, Simon" and many more. As previously announced, HRC-backed Senate candidate Kyrsten Sinema and Representative Maxine Waters will speak and Grammy Award-winning rock band Portugal. The Man will perform at the event. The HRC Los Angeles Dinner brings together more than 1,000 of HRC’s most active members and supporters in the greater Los Angeles area to raise crucial funds in the fight for LGBTQ equality.